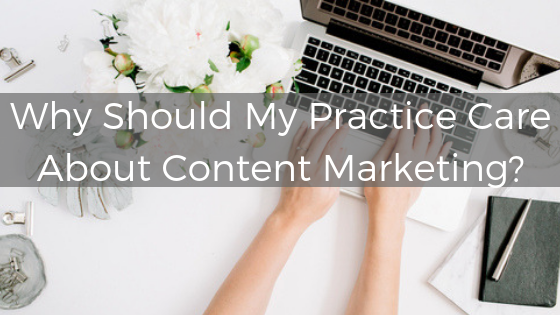 Why Should My Practice Care About Content Marketing? Your practice is familiar with digital marketing by now. You know that more and more of your potential leads are tuning out radio ads, billboards, and blatant newspaper advertising. Maybe you’ve dipped your toe into the water with paid search, or you’ve considered taking your SEO to the next level. Whatever level your digital marketing is, it’s time to learn why content marketing needs to be part of your digital strategy in 2019! Let’s start at the beginning: what is content marketing? Content marketing is the creation of content that provides relevant and useful information to your target audience. Almost anything that is considered “content” can be part of content marketing, but like the rest of your marketing, you need a strategy. Without a strategy, content marketing for your practice will fall flat, at best. With a content marketing strategy in place, your practice can build branding awareness and visibility. We all know that blogs are important, especially for SEO. Here’s what you may not know: engagement is the key to success with blogging. Yes, Google likes that you’re posting on a regular basis, but to get to the next level, your blogs need engagement. This is where content marketing comes in. Most of your patients or potential leads just don’t care about your blogs. They may not even know you have a blog that you update regularly! So how do you solve this problem? Engagement, courtesy of social media. A blog that is shared, commented, and liked on networks like Facebook, Twitter, LinkedIn, and Instagram is infinitely more useful than a blog that gets no hits or traffic and is forgotten. If your practice is getting consistent engagement on blogs on social media, your content has suddenly become that much more valuable! Without traffic, your website might as well not exist. You could have a stunning responsive site, but none of that matters if nobody is visiting it. There are a lot of tactics that you can take to get more traffic, and some are more controversial than others. We recommend you stay away from spammy links bought in India and instead think about content marketing. Besides blogging, you can produce other kinds of content: videos, gifs, or white papers that people have to download off of your website. As long as your content is useful, your audience will want to engage with it. When you have engagement, you can count on your content marketing to provide an increase in website traffic. Getting in front of your potential patients is just the first step. Once you get in front of them, how are you going to keep them captivated? Now that we’ve learned the impact that content marketing can have on your website traffic, it only makes sense to talk about how it can help your SEO as well. Search engine optimization can be complicated. Good, quality content isn’t. Google notices when you’re producing content and posting it on your website. If you’re blogging weekly, Google knows. It’s kind of creepy but it’s true! If you’re blogging weekly and then sharing that same post on social media networks and garnering engagement, Google knows that too. Combine engagement and website traffic and you could have a serious impact on your SEO. Not only are you producing content, but you are producing quality content. Quality content is king! Quality content could help your search rankings go up. It might even help your blog posts or other pieces of content start ranking too! If you’re ranking number 1 on Google, have paid search ads in the first spot, a high spot in the map packs, and a few of your blogs are ranking, you are dominating. When that potential patient is finally ready for LASIK, your practice is going to be at the very top of their mind, thanks to your content and digital marketing strategy. If you want more patients, they have to see that you are an expert. A lot of medical practices forget that part of marketing should be about education. Word of mouth referrals are great, but you need to have multiple ways to get more patients in the door for consultations and appointments. If you create content that is educational and shows that you are an authority, people will notice. Yes, content marketing from a digital marketing perspective is smart, pure and simple. But it’s also about how your patients and those leads are perceiving you. Every patient that walks through your practice’s doors wants to know that they are in the best hands possible. Share your knowledge with the world, courtesy of content marketing. When it comes to creating the best content and digital marketing strategy for your practice, Glacial has you covered. Want to learn more? Give us a call or fill out the form below!